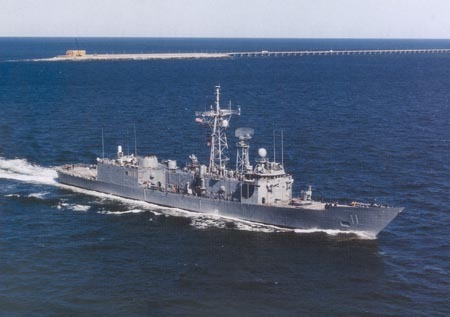 The USS Clark (FFG-11) was the second in the Oliver Hazard Perry Class Frigates. She was delivered to the U.S. Navy on May 9, 1980, and on March 15, 2000 she was decommissioned, and turned over to the Polish Navy at a Decommissioning Ceremony in Norfolk, Virginia. "A frigate is a lovely ship, probably the nicest fighting ship of all. Battleships are a little like steel cities or great factories of destruction. Aircraft carriers are floating flying fields. Even cruisers are bit pieces of machinery, but a frigate is all boat. In the beautiful clean lines of her, is her speed and roughness, in her curious gallantry, she is completely a ship in the old sense." © 1999-2003 Utility Press Inc. All rights reserved. Copyright claim exclusive of photograph, and quoted text.